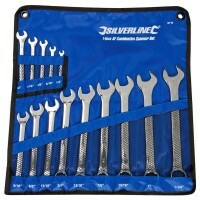 Silverline SP1236 Combination Spanner Set Features 12 piece set. 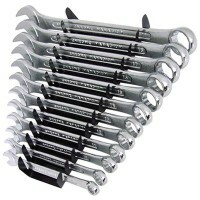 Chrome vanadium co..
Bahco 10RM/SH6 Stubby Ratcheting Combination Spanner Set Features 6 piece professional st..
Silverline SP52 Imperial Professional Combination Spanner Set Features 14 piece nickel-pl.. Size 32mm combination spanner. Thin profile and mirror polished. Raised panel spa.. Size 30mm combination spanner. Thin profile and mirror polished. Raised panel spa.. Size 8mm combination spanner. Thin profile and mirror polished. Raised panel span.. Size 7mm combination spanner. Thin profile and mirror polished. Raised panel span.. Size 21mm combination spanner. Thin profile and mirror polished. Raised panel spa.. Size 30mm. 8 degree ratchet action. Fixed head. Mirror polished. 40 c.. Size 10mm combination spanner. Thin profile and mirror polished. Raised panel spa.. Size 13mm combination spanner. Thin profile and mirror polished. Raised panel spa.. 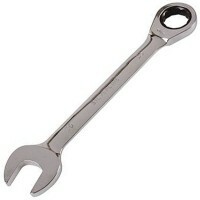 Size 16mm combination spanner. Thin profile and mirror polished. Raised panel spa.. Size 15mm combination spanner. Thin profile and mirror polished. Raised panel spa.. Size 24mm combination spanner. Thin profile and mirror polished. Raised panel spa.. Size 19mm combination spanner. Thin profile and mirror polished. Raised panel spa..